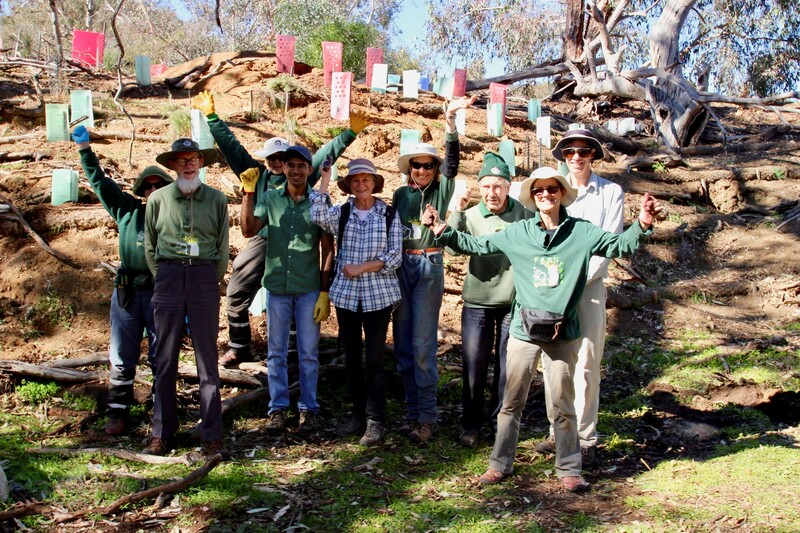 The Mount Ainslie Weeders are a group of volunteers aiming to preserve and protect the natural beauty of Mt Ainslie Nature Park, which includes critically endangered areas of Yellow Box - Red Gum grassy woodland. As needed and in close collaboration with the rangers, we also work in other areas of the reserve, mainly around the western lower slopes of the mountain, close to the suburb of Ainslie. We are always looking for people who are willing to help with these rewarding tasks. There is no prior experience needed. We hold regular work sessions every first Sunday of each month (summer 8:30am start, winter 9am start), usually lasting until lunch time. All you need to bring is appropriate clothing (long sleeves and pants), sturdy shoes, gardening gloves, sun protection and drinking water. We will provide the tools and the all-important morning tea. Note- the meeting point for these activities varies so we recommend emailing mtainslieweeders@gmail.com to confirm the meeting point prior to attending your first event. The Mt Ainslie Weeders remain a strong group, welcoming some valued new members in 2018. We have also enjoyed some extra ‘hands on deck’ through the Hub. A highlight in what’s been a tough year has been the continued planting in our ‘Great Vinca Patch’. 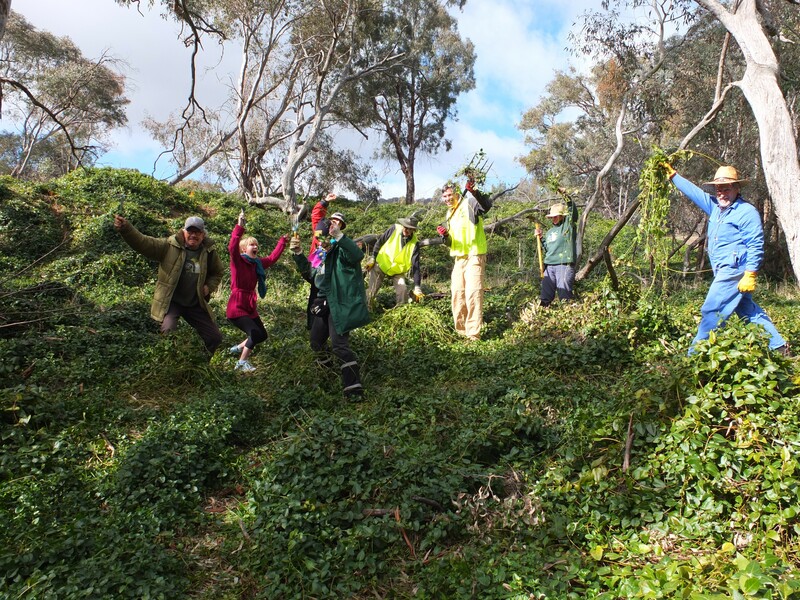 In 2013 we first started work to remove this massive area of vinca extending from the lower section of the old Ainslie Tip down a steep embankment and into a wide valley shaded by lovely old eucalypts. It has taken enormous effort and we have appreciated assistance from school groups and members of the general public as well as sound advice and practical support from very committed rangers. This year we continued with our planting program, using very large tree guards to protect the new seedlings. Removal of the inevitable growth of woody weeds is an ongoing activity. We have extended out from our usual areas to spray Paterson’s Curse but are struggling to deal with St John’s Wort as the rain seems to fall on each of our Work Party days. Other activities have included involvement in rabbit mapping, mapping of bridal creeper and removal of several patches of honeysuckle. This year however, Mt Ainslie Nature Park together with Mt Majura are experiencing significant overgrazing from kangaroos and rabbits. Kangaroos descend from the mountain at dusk to graze in suburban gardens and sports grounds. The holding capacity of Mt Ainslie/Majura is 581. The current population is estimated at approximately 5000. We are assured that these numbers will be reduced over time, but in the meantime the vegetation is being eaten out. Even those tough lomandras, ignored in the past by kangaroos, are now chewed to the ground. Any new growth from the recent, welcome rains will be instantly attacked. As the vegetation disappears the incidence of erosion increases. The situation brings into question the value of all those activities we have traditionally carried out, and we are currently seeking expert advice on our role in this ‘at risk’ environment. Thanks to Jeanette, our wonderful coordinator, to Alison and Marty, and the local rangers who provide such valuable support.